The perfect storm included: damage from the December 2017 Thomas Fire which required a sustained focus on repairs and maintenance at Meher Mount; no Manager/Caretakers living on site in the caretaker quarters, thus, creating the opportunity to make the repairs without disrupting their lives; and donations, cash reserves, and the insurance reimbursement for fire recovery and renewal. In the intervening 25 years since the Visitor Center/Caretaker Quarters was built, there were ongoing repairs and upkeep. From 2010 to 2014, upgrades were made to the building, including a new roof, installation of tile floors, refurbishment of the kitchen, and painting the exterior of the building. So, why was additional work needed at this time? The list of repairs started with fire damage. As each fire-related item was examined in detail, other related issues arose. The choice became: Does Meher Mount just fix the fire-related repair, ignore other problems, and postpone a complete solution? Or does Meher Mount try to fix the entire problem now? The answer was to fix the entire problem now. This decision was influenced by the fact that funds were available; the focus and energy were there; there were no live-in caretakers – whose lives would be further disrupted by the repairs; and the desire to not face the same issues again in the coming years. The impetus was to solve, repair, upgrade, and refurbish now; and then be free in the future to focus on new projects and activities at Meher Mount. Smoke damage and the presence of residual smoke particles harmful to visitors and future residents was a concern after the Thomas Fire. In response, the interior was scrubbed from top to bottom, including the ceilings. There was still apprehension about residual smoke particles in the air conditioning/heating system. Professionals were called in to clean the air ducts. While investigating the heating and air conditioning system, it was determined that there was a potential fire hazard in the hookup, an incompatibility with the compressor, and recent plumbing issues. In addition due to age and limited longevity, parts of the heating/air conditioning (HVAC) system would need replacement soon. The Meher Mount Team reasoned, “Let’s not give this problem to future Manager/Caretakers. Let’s take care of it now.” The result was a new heating/air conditioning system with the required plumbing and right-sized compressor. And, the air ducts were cleaned. 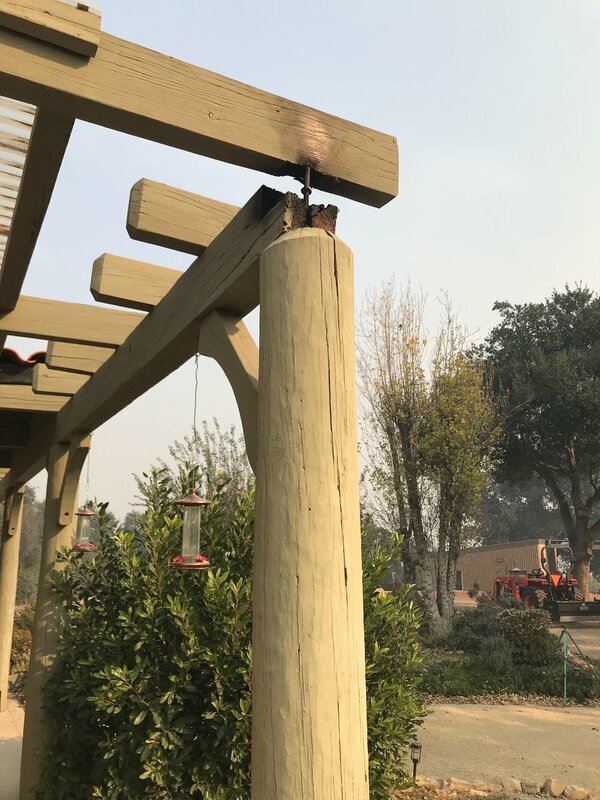 Next on the list of repairs was the burned corner of the outside trellis – a seemingly small item that was not even addressed until four months after the fire in March 2018. That small burned corner turned out to be a blessing in disguise. It led to the discovery of termites and dry rot throughout the trellis. The beams with fire, dry rot and termite damage were replaced. All the wood was sanded and repainted. As an upgrade, the translucent, plastic sections of the trellis shade were replaced and extended with metal shade covering painted to match the beams. This higher quality shade reduces the heat glare in the building and create a shaded area on the building’s patios. The extended roofing also helps protect the wood from sun and water damage. A walk through the empty Visitor Center revealed gaps between and under the closed doors. These gaps invited dust, rodents, snakes and rain inside. In addition, the some of the window and doors frames were warped, and it was difficult to open them and close them properly. In addition, the double-pane windows in the kitchen and one of the bedrooms had moisture permanently embedded between the panes. There was a hole in the bottom corner of the back door stuffed with a Brillo® pad. After months of research and careful budgeting, it was decided to replace the doors and windows on three sides of the building. The retro-fitted doors and windows are vinyl-framed and energy-efficient with tempered-glass with a lifetime warranty. The fourth side of the building – include the door with a hole stuffed with a Brillo® pad – need the upgrade as well. Meher Mount also used refurbishment of the Visitor Center as an opportunity to support the plan for the preservation of Baba’s Fireplace and the enhancement of the surrounding courtyard area. Baba’s Fireplace is part of the living room of the guesthouse where Meher Baba met with His followers and gave darshan on August 2, 1956. Meher Baba’s time in this room is captured in the photograph with Him sitting in a wing-back chair with Agnes Baron by His side. The entire building was destroyed in the 1985 New Life Fire. AVATAR MEHER BABA in the guesthouse at Meher Mount on August 2, 1956. Seated next to Him is co-founder and lifetime caretaker Agnes Baron. This building — with the exception of the fireplace — and all the other buildings on the property were destroyed in the 1985 New Life Fire. The fireplace area was generally accessible by going outside and around the building. Over the years, the door in the Visitor Center leading to the fireplace area had been blocked by living room furniture and not used for entry or egress. Since the fireplace/courtyard area was now a more integral part of the visitor experience, there needed to be access from inside the Visitor Center. But, there also needed to be future space for furniture in the main room. Removing an unused wood-burning stove in the opposite corner of the main room created more useable space in the main room. That new area accommodates more seating and living room furniture. As long as Meher Mount was doing some remodeling, why not consider another small project that would help to welcome and orient visitors? Removing a non-supporting pilaster between the reception foyer and the meeting room would improve access to the meeting room. Without this barrier, visitors would naturally feel more welcome and be guided to explore further. Once the remodel was completed and the replacement windows and doors were installed, it was time to paint the entire interior of the building. One option was to paint the remodeled areas only. However, it had been approximately eight years since the interior had been repainted. It was time for a fresh coat that matched the window/door frames and upgraded the entire look and feel of the building – both for those living there and for visitors. Unfortunately, during the painting process, water leakage in the ceiling was uncovered. After further inspection, it was determined that the roof needed extensive repair as did the interior wall and ceiling damage. Both projects were completed well before the potential winter rains. 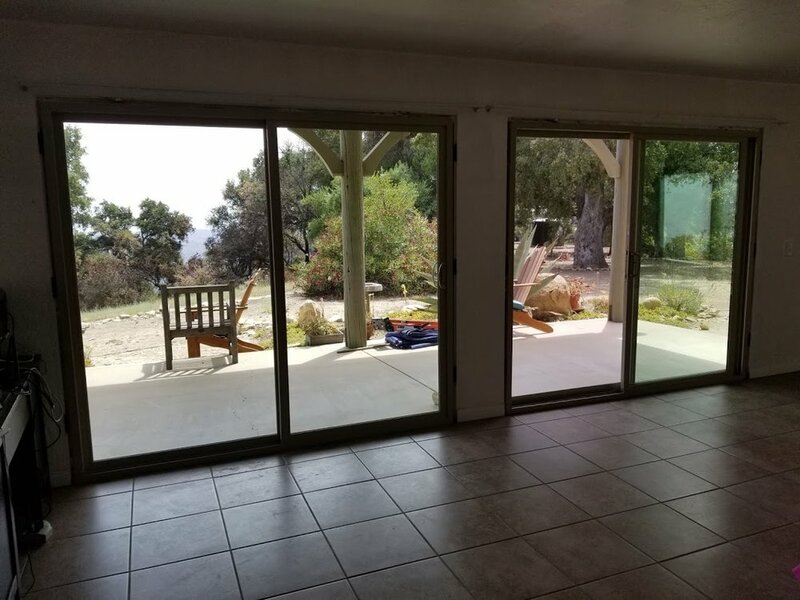 In the immediate months after the Thomas Fire, no one foresaw the extent of work that would take place on the Visitor Center/Caretaker Quarters. Fortunately, circumstances created the opportunity for improving the building and the Meher Mount experience for both visitors and the caretakers living there. CONSTRUCTION of the Visitor Center and Caretaker Quarters in 1993.